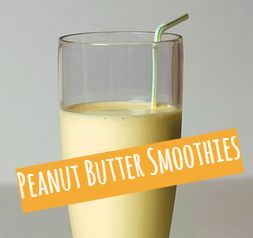 Peanut Butter Smoothies: Healthy, Filling, Delicious! If you're a peanut butter lover, then you must enjoy peanut butter smoothies. What's there not to like? Nutty PB blended with fruity or chocolatey ingredients to make a creamy, healthy and protein-rich drink. It's a treat you can drink! "Blueberries are chopped full of antioxidants and a great source of nutrition. They are delicious to munch on alone, for pies, to add in to your morning oatmeal or my favorite; Banana Blueberry Peanut Butter Smoothie." "It’s still just 100 calories per scoop, but uses an endurance blend of protein powders (whey, soy and casein). If you’ve never tried peanut butter in your smoothie, I HIGHLY suggest it. It’s one of my favorite things to add to my smoothie :)"
"This chocolate shake is smooth, rich, creamy, chocolatey, dreamy and decadent, while also being hearty and healthy." Feeling a little festive? Top peanut butter smoothies with chopped fruit leathers or piped chocolate. Use silicone baking mats to make your chosen garnish. Not only are silicone mats sturdy and durable. Because they're non-stick, you can also cut your clean up time in half.